Choose a one-of-a-kind card for your one and only this Valentine’s Day. Whether you’re looking for a free ecard or a printed greeting card, Canva’s free online Valentine’s Day card maker has the solution for you. We’ve got hundreds of Valentine’s Day card templates waiting for you to add your personal touch, with something to suit every taste. Our options range from the traditional and romantic to playful and irreverent. Want to create something truly original? Easy! Simply open a blank template and use Canva’s drag-and-drop tools to add text, colors, graphics and photos. No need to use the scissors and glue: DIY Valentine’s Day cards have never been so easy. Forget the generic, shop-bought greeting cards this Valentine’s Day. With Canva, you can design a custom Valentine’s Day card in minutes. Choose a Valentine’s Day card template (Canva has hundreds!) or you can design your own card from scratch. These are pre-set at the perfect size, so they’ll be easy to print. Change the images. Make your card unique by uploading your own photos, or you can choose one from Canva’s image library, which has over 2 million beautiful stock images. Add a message to your Valentine. Canva has hundreds of free fonts to choose from, so you can say it in style. Print, download or share your Valentine’s Day card. 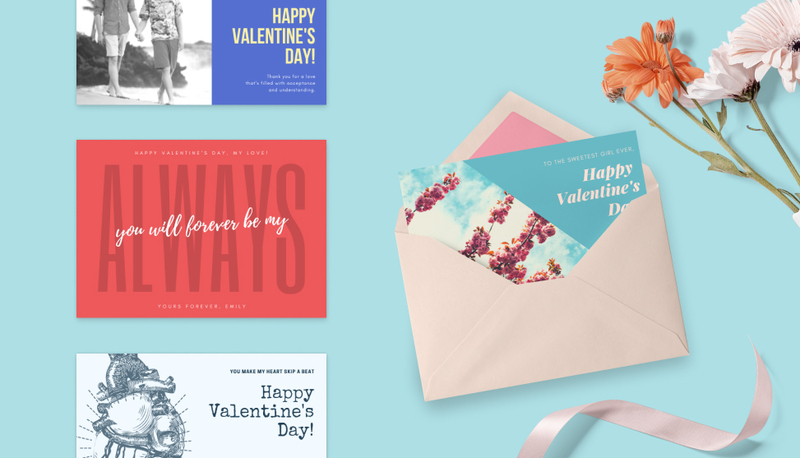 Unlike other sites, Canva lets you choose how you want to deliver your custom Valentine’s Day card—whether that’s online, in person or in the post. Once you’ve finished customizing your card, you can choose from a huge selection of publishing options. If you want to go the extra mile, choose Canva Print. We’ll make sure your Valentine’s Day cards look as great in person as they do on your screen. With affordable prices and a 100% satisfaction guarantee, we’re determined to print cards that you’ll love. We’ve got premium quality paper, gorgeous finishes, and we deliver to your door. Or perhaps a Valentine’s Day ecard is more your style. With Canva, you can send your finished card via email, social media and more. The best part is, it’s totally free! They say a picture is worth a thousand words—so show your loved one how you really feel by creating a Valentine’s Day card with a photo. Upload your photo to Canva, and remind them of special moments you’ve shared. Uploading photos to Canva is free—and easy! Just drag your photo into the editor from your desktop, then drag it into your Valentine’s Day card. I want to send a Valentine’s Day ecard. Can I do this on Canva? Share your content directly from Canva with just a few clicks. Once you’re done putting the final touches on your card, you can share your design via email or on social media. You can even embed the design on your website through an HTML tag generated by Canva. I want to use my own photos in my Valentine’s Day card. Is there a limit to how many I can upload? There’s no limit—you can even upload multiple photos at once. Just make sure your photos meet the file requirements: JPEG, PNG or SVG files. Can I still add changes after I have saved my card design? Yes. You can add edits to your Canva designs any time by accessing them from your Canva homepage. Click on your design, or make a copy of it, add your changes and hit the download button again.